Vote Now: The 2013 Readers' Choice Awards! 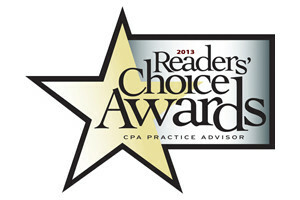 Its Voting Season so Vote Your Favorites Now in the 2013 CPA Practice Advisor Readers Choice Awards! In the last most recent Accountants and Tax Professionals Readers Choice Awards, Cloud9 was the winner of Best Accounting Cloud, by a veritable landslide. Can we do it again? Take the 2013 CPA Readers’ Choice Survey now and don’t forget Cloud9 on poll question #33! > Deadline for voting is Thurs, Nov 9th @ 6:00 p.m. EST. 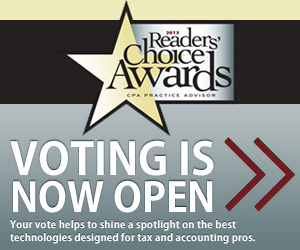 Each year, the Readers Choice Awards gives CPA Practice Advisor readers the opportunity to help shine a spotlight on the technologies, services and vendors they use and trust — the ones that help them succeed in their profession, and those that they find valuable for their clients. Categories include accounting clouds and ASPs, SaaS, tax compliance, payroll, practice management/time & billing, document management, online applications, small and midsize business accounting programs, construction/contractor accounting systems, write-up and trial balance, estate and financial planning, fixed asset management, tax research, laptops, PDAs, scanners, printers and more. The voting period for the Readers Choice Awards is only open until the deadline of Thursday, November 9, 2012 at 6:00 p.m. Eastern time. Anyone can vote. Please take the survey now.